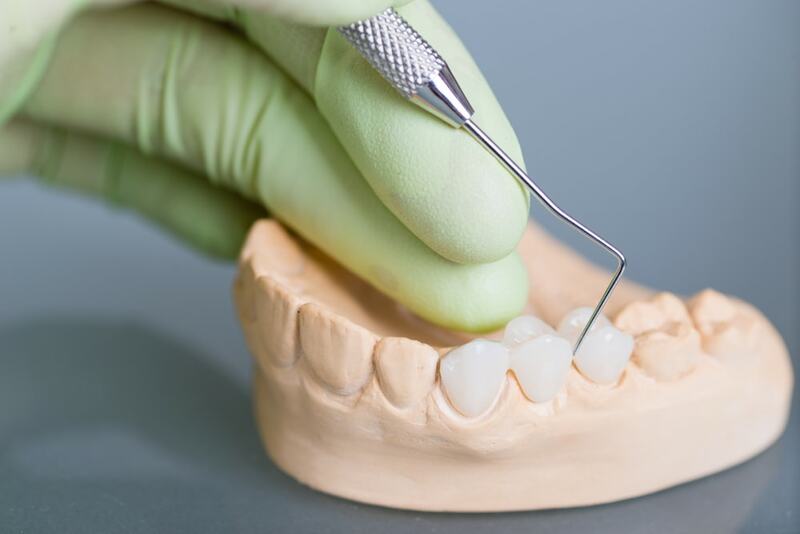 A dental bridge is made by designing a crown for the teeth on each side of the space and then placing a false tooth or teeth between these crowns. The dental crowns, sometimes called caps, can be supported by natural teeth or by dental implants. The false tooth or teeth are connected to the crowns and occupy the empty space. If the teeth receiving the crowns are healthy and strong, they will most likely not require root canal therapy. However, parts of your teeth are likely to be removed to make space for the crowns. Traditional bridges are made either of porcelain fused to metal (PFM) or ceramics. There are some other types of bridges as well. A cantilever bridge is held in the mouth by one or even more crowns on only one side of the space where a tooth is missing. A Maryland bonded bridge consists of a metal framework with wings on each side. The wings are bonded to the back of your existing natural teeth. The false teeth will also be affixed to the framework. This kind of bridge can also be called a resin-bonded bridge or an acid-etched bridge. Bonded bridges typically are not as expensive as conventional bridges. That’s because surrounding teeth need less preparation and do not require dental crowns. However, these bridges are only as strong as the bonding material. Resin-bonded bridges tend not to stay cemented in place as well as other varieties of bridges where there is a lot of biting force. They also may not be the best solution if the wings will have to be small in order to avoid getting in the way of the bite or the gums. Obtaining a dental bridge requires at least two office visits, and sometimes more. At the initial visit, your dentist will prepare the area and applies the temporary crowns. Your dentist may probably make impressions of the teeth. The final dental bridge is placed in a later visit, once it has been produced. On average, bridges last five to seven years. The most common reason a bridge fails is that new cavities develop on the supporting teeth. it is very important that you brush and floss your teeth daily, and have regular dental checkups.